Entrepreneur: Rick Stafford, inventor, outdoorsman and former oil-field worker on Alaska's North Slope--the kind of guy "who will take three hours to build a tool to turn a two-hour job into 30 minutes." "Aha" moment: An avid snowmobiler (or, as they call them in the 49th state, snowmachiner), Stafford wished to create an easy-to-pack means to walk away from vehicles that break down in deep snow. He was inspired, he says, by two people who were stranded less than a mile from a lodge "but couldn't walk in the chest-deep snow, and ended up spending the night out there under a tree. They were found the next day by a rescue group and helicoptered to Anchorage suffering from hypothermia and frostbite. It was time to do something about that." 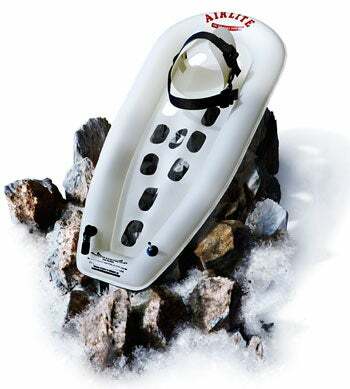 Airlite inflatable snowshoes were born. Airtight solution: Full-size snowshoes strapped onto the back of a snowmobile can get in the way as riders zip through trees. Compact models, meanwhile, become as useless as flip-flops in deep snow. "The first thing that clicked in my mind was, Well, what if we had something inflatable?" Stafford recalls. He put a bicycle inner tube, plastic netting, glue and a nylon strap to work for an early version and, "by golly, they worked." Stafford knew his final materials would need to maintain their integrity in extreme cold. He had an inflatable boat at home that incorporated a "paper-thin material that was as tough as nails," he says. "So I took it and threw some of it in my deep freezer, which gets to about 30 below, and after a week I went out there and played with the material, and it was still just as flexible and just as tough as the day I put it in there." He contacted the manufacturer and learned the material was called Deerfield Urethane. Sporty specs: Airlite snowshoes are rimmed with an inflatable tube, all made of the extremely puncture-resistant Deerfield Urethane. They have a binding that can be used with any shoe and can support up to 280 pounds. They're kid-friendly, too. Stafford recalls a father and his young son--"his feet had to be about 8 inches long"--trying on the same pair at a trade show. "Not a problem," he says. Sold at AirliteSnowshoe.com, the shoes run $168 per pair; a package that includes an air pump, patch kit, crampons and a storage bag costs $220. Though the snowshoes were devised for lifesaving, they're sturdy enough for ongoing recreational use--Stafford has inflated his original pair hundreds of times. Tough talk: Growth has come mostly from word-of-mouth, trade-show appearances and media mentions. In 2012 Stafford won the $10,000 top prize at the University of Alaska Fairbanks' Arctic Innovation Competition. But perhaps his greatest promotional tool is a photo, used on the website and in marketing materials, of an Airlite snowshoe-wearer standing on a bed of nails. Great outdoors: Stafford has learned that he has a much wider customer base than he initially imagined, including pilots, fat-bike riders, extreme campers, skiers, hunters and fishermen. He has sold snowshoes to customers in the U.S., Canada and Europe. Up next: Stafford sees potential in sales to the military or to police organizations. He's also working on a snowshoe that can handle heavier loads for bigger guys and all their gear.